While Cuban cigar brands such as Cohiba and MonteCristo are familiar to even those who may enjoy the rare cigar once in a blue moon, the people who really are discriminating in their choice of cigar are going to stick with the brands that they know once trade with Cuba opens permanently. Why? Because while Cuban cigars used to be considered the Holy Grail within the tobacco industry, it wasn’t necessarily because they were the best. It was simply because they were embargoed and prohibited to bring to the states. In reality, seeds from authentic Cuban tobacco are now grown in Nicaragua, Honduras and the Dominican Republic under even more exemplary conditions than some native Cuban tobaccos. That’s why at Gurkha, we have been canvassing the world over to acquire the most exotic tobaccos grown to make our prestigious Gurkha cigar blends. In fact, just recently, we have released three brand new Gurkha blends and our first Lancero ever in The Classic: Havana Blend cigar. The Classic: Havana Blend has a Mexican San Andres wrapper over three-year Nicaraguan binder and fillers from the most fertile regions of the country: Jalapa and Esteli. It’s medium bodied and full flavored with earthy, nutty undertones. It retails for $8 a stick. Our three new cigars are the Cellar Reserve Platinum Edition, the Heritage and the Cask Blend. Each of these three cigars was exclusively blended with proprietary tobaccos that make a one-of-a-kind smoking experience. Those who know Gurkhas can attest to this. For detailed information on these new releases, visit http://www.gurkhacigars.com/core-brands.html. The ‘Mahajara’ is a secret blend of the best quality tobaccos available. The beautiful maduro wrapper pairs Dominican binder and fillers to create a smooth and sweet taste on the lips. The Gurkha Maharaja is medium bodied and also one of a kind. And, as with all luxury premium Gurkha Cigars, the ‘Maharaja’ is available only in small quantities – boxes of 10 cigars - and in limited release - only 100 boxes are being sold. Also, in keeping with the Gurkha tradition of presenting cigars in unique, award-winning artistic packaging, the ‘Maharaja’ is presented in a stunning, 10-count Mahogany wooden humidor with 10 individual piano-finished mahogany coffins for each cigar. It retails for $20,000 a box. Our clients include Presidents, Monarchs and Shieks; A-List Celebrities; Fortune 500 CEOs, and the top members of the Special Forces and Navy SEAL teams. Former President Bill Clinton is often seen on the golf course smoking a Gurkha cigar and Academy Award-winning Actor Matthew McConaughey is a huge Gurkha aficionado. Let’s just say if Gurkha’s weren’t the premium luxury cigars that they are, I’m pretty sure the Ambassador of Japan wouldn’t have presented Gurkha cigars to Fidel Castro on a diplomatic visit to that Island Nation. Gurkha cigar provides a luxurious experience different from the last. 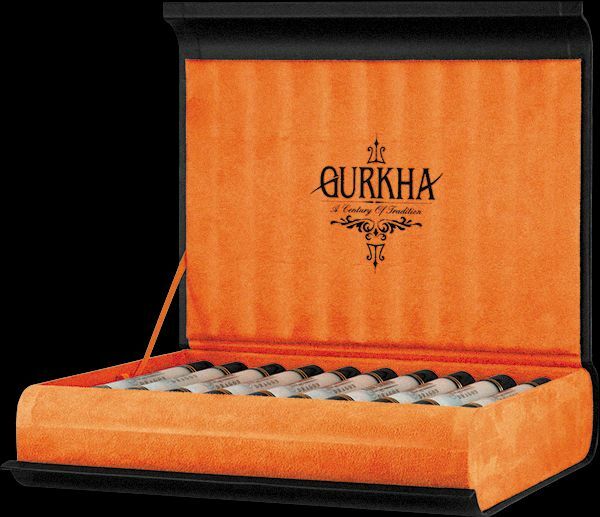 And every Gurkha cigar is housed in a beautifully appointed box with a unique story to tell. It’s that uniqueness that has made Gurkha the Rolls Royce of Cigars.